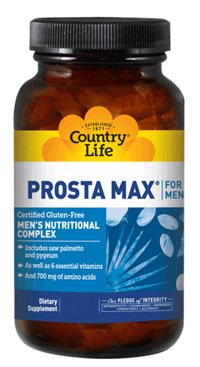 Prosta Max, 100 tablets (Country Life) - Penn Herb Co. Ltd.
Prosta-Max® for Men is a multifaceted complex that includes key ingredients to provide nutritional support for men’s health. Prosta-Max® contains Saw Palmetto and Pygeum, along with 6 essential vitamins and 700 mg of amino acids for added support. Adult males, take 2 tablets daily before a meal. As a reminder, discuss the supplements and medications that you take with your health care providers.